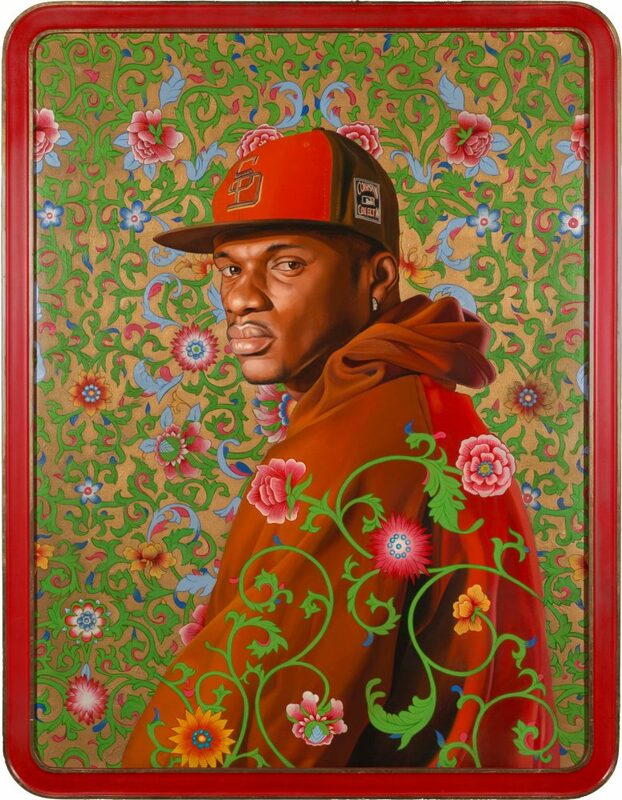 Kehinde Wiley’s extraordinary paintings engage motifs from master portraitists—Reynolds, Titian, and Ingres, among others—as a means to critique and expand contemporary visualizations of black men and women. The paintings originate from encounters with people on the street. Once a person agrees to pose for Wiley, he photographs them in a variety of dramatic, heroic postures, many of which derive from canonical sculptures and paintings. From these source images, Wiley creates large-scale, painstakingly detailed oil portraits. Each portrait is composed atop exuberant decorative backgrounds. Often these backgrounds correspond to a sitter’s place of origin, or the geographic focus of a particular series. For example, in Cheick I, from Wiley’s The World Series: China, the sitter poses against patterns drawn from lush Chinese silks and intricate patterns from the Ming Dynasty. Unlike Wiley’s earlier portraits wherein sitters’ poses correspond to artworks from the Western canon, the China series derives inspiration from Chairman Mao’s “model behavior” posters. By combining elements of China’s communist history and material culture with portraits of black men, Wiley presents a revolutionary remix of cultural identities. Like other portraits in the China series, in Cheick I Wiley likely merges motifs and poses from Chinese propaganda with quotations from canonical portraits, in this case Vermeer’s Girl with Pearl Earring. In Cheick I, Wiley’s subject gazes over his left shoulder, practically looking right through us. He wears a red and brown baseball cap with a gold San Diego Padres logo and a similarly colored hooded sweatshirt. A silver earring adorns his left earlobe. Wiley regularly tweaks the color of his sitter’s clothing to amplify the aesthetic impact of his portraits. The sitter’s baseball cap is red, brown, and gold. However, the makers of the hat—the Cooperstown Collection—never produced a Padre’s cap with this coloration. As such, Wiley possibly selected his red palette as a reference to the Communist Party of China.